Armezon herbicide is a highly flexible postemergence solution that is designed for high-yielding corn growers. As an effective cross-spectrum tank-mix partner, it is tough on broadleaf weeds and grasses to protect yield potential, yet safe on corn. Armezon features a unique chemistry that gives corn growers the upper hand in postemergence management of broadleaf weeds and grasses, such as common lambsquarters, waterhemp, giant foxtail and crabgrass. At the same time, it is ultra-safe on corn, even the most sensitive specialty varieties. Armezon is specially designed with a high intrinsic activity level compared to other HPPD inhibitors, resulting in a low use rate that is about one-third less than most competitive products on the market. It also offers a wide window of application and gives growers the freedom to easily tank mix with additional products based on their unique needs. 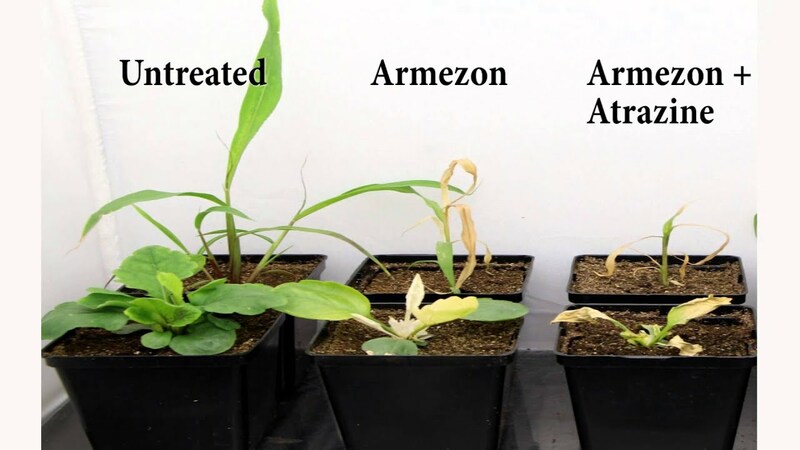 Field trials have demonstrated that Armezon is safe for use on all field (grain, silage and seed) and specialty corn (sweet corn, popcorn and food grade), regardless of trait or variety. Armezon herbicide is a highly flexible post emergence solution designed to help corn growers protect their yield potential. An effective, cross-spectrum tank-mix partner, Armezon herbicide features a unique chemistry that gives growers the upper hand in management of weeds such as common lambsquarters, ragweed, waterhemp, giant foxtail and crabgrass. At the same time, field tests have indicated it is ultra-safe on corn, even sensitive specialty varieties.